Greatly underrated fishes, the threadfin salmons yield thick, sizeable and essentially boneless fillets. They are often available, have a high recovery rate and can have a good shelf life. Threadfin salmons are excellent eating when cooked in a wide variety of ways. Their firm flesh and large flakes make them absolutely ideal for barbecuing or grilling in steaks, cutlets or fillets, depending on size and variety. The flakes can also be carefully separated after grilling to enhance presentation. The thick, firm fillets of threadfin salmons make them ideal for use as kebabs (cubed) and in soups, curries or casseroles. Ideally suited to citrus flavours, threadfin salmons can be accom-panied by butters flavoured with herbs such as chives, tarragon and parsley. They are also superb baked, served with roasted vine-ripened tomatoes and fresh herbs. Bones There are bones in the fillets but they are easily removed. Price Threadfin salmons are medium- to high-priced finfish. 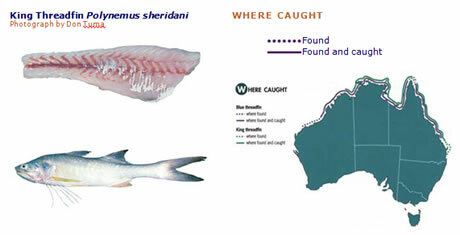 King threadfin fetches a high price, blue threadfin a medium price. Threadfin salmons are good eating, flaky, tropical finfish that readily absorb the flavours of other ingredients. Wines to match highly flavoured dishes should be light-bodied reds made in the Beaujolais style. Fillets: 70% from headless blue threadfin (gilled and gutted), King threadfin often have large bony growths along the backbone, which make them difficult to fillet. They are therefore often sold as cutlets for maximum recovery. Threadfin salmons are popular recreational species in Western Australia and northern Queensland. The king threadfin usually has five long filaments below the pectoral (side) fin, whereas the blue threadfin has only three or four short filaments.